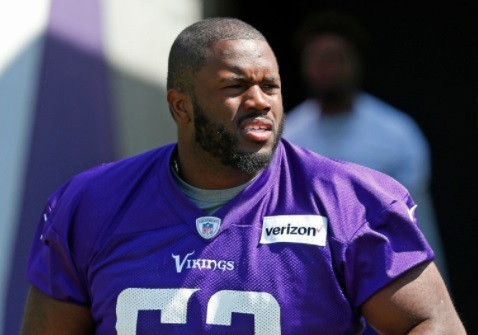 Can Danny Isidora provide a needed push for the Vikings offensive line? Fifth-round pick Danny Isidora has made a strong impression in the early going, even moving his way into the first-team lineup at right guard. “I’ve been impressed with Isidora the whole time he’s been here,” head coach Mike Zimmer said. MANKATO, Minn. — If you’re watching the Vikings this preseason, you may see a new No. 63 at guard get some extended playing time. Fifth-round pick Danny Isidora has made a strong impression in the early going, even moving his way into the first-team lineup at right guard. That position has lately been a carousel, still led by veteran Joe Berger, but including Isidora, T.J. Clemmings and even both centers Pat Elflein and Nick Easton. Isidora (6-3, 306 pounds) was a three-year starter at right guard for the Miami Hurricanes. The Vikings took him with the 180th-overall pick this spring, and could use another late-round surprise. The years are stacking up since Minnesota drafted and developed former Vikings Brandon Fusco (2011) and John Sullivan (2008) into starters. What first strikes you about Isidora is his size at 23 years old. He looks the part of NFL guard already, especially when you see him get moving and run after a defensive back on a pulling assignment. He’ll need to do more of that when the Vikings open the preseason Aug. 10 in Buffalo. Isidora could provide a needed push for an unsettled Vikings offensive line with 16 players at camp competing for, typically, nine spots on the 53-man roster. Poll: Who do you think will be the Vikings starting quarterback in 2018?